Gladstone is a city in the Gladstone Region, Queensland, Australia. It is approximately 550 kilometres (340 mi) by road north of Brisbane and 100 kilometres (62 mi) south-east of Rockhampton. Situated between theCalliope and Boyne Rivers, Gladstone is home to Queensland's largest multi-commodity port. The city's population at the 2011 Census was 31,778 of whom 4.1 percent are of Aboriginal and Torres Strait Islander origin. 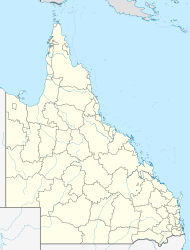 The City of Gladstone contains a land area of 128 square kilometres. In addition to the mainland area, the Local Authority Area contains fourteen (14) islands. The Gladstone Regional Council, formed in 2008, amalgamates multiple previous local government areas. The Providence Nugget, found in Gladstone in 2004 with a metal detector. Prior to European settlement, the Gladstone region was home of the Baiali (or Byellee), Goereng and Goreng Goreng Aboriginal tribes. In May 1770, the HM Bark Endeavour, under the command of James Cook, sailed by the entrance to Gladstone Harbour under the cover of darkness.Matthew Flinders, during his 1801–1803 circumnavigation of Australia, became the first recorded European to sight the harbour in August 1802. He named the harbour Port Curtis, after Admiral Roger Curtis, a man who was of assistance to Flinders years earlier at the Cape of Good Hope. John Oxleyconducted further exploration of the harbour and surrounding countryside in November 1823. Oxley was dismissive of the region, noting the harbour was difficult to enter, the countryside was too dry, and the timber useless for construction purposes. Nevertheless, a colony was eventually established at Port Curtis. Colonel George Barney's expedition was eventful. On 25 January 1847, the Lord Auckland, carrying 87 soldiers and convicts, arrived off the southern entrance of Port Curtis and promptly ran aground on shoals off the southern tip of Facing Island. The settlers spent seven weeks on the island before being rescued by the supply ship Thomas Lowry and delivered the intended site of settlement, the region now known as Barney Point. On 30 January at a proclamation ceremony, Barney was sworn in as Lieutenant Governor of the colony of North Australia. The convict settlement lasted barely two months. A change of government in Britain ordered the withdrawal of Barney and the settlers. However, interest in the region remained. By 1853, Francis MacCabe was surveying the site of a new town on the shores of Port Curtis. Maurice O'Connell was appointed government resident the following year, resulting in an influx of free settlers as land became available throughout the region. In 1863, the town became a Municipality with Richard Hetherington elected Gladstone's first mayor. The fledgling town was named after the British statesman William Ewart Gladstone and has a 19th-century marble statue on display in its town museum. Development of Gladstone was slow until 1893, when a meatworks was established at Parsons Point. On 2 March 1949, a major cyclone hit Gladstone, doing extensive damage to the town. In 1963, Queensland Alumina Limited established its alumina refinery on the site of the old meatworks. Gladstone's port facilities were expanded and the city launched into an era of industrial development and economic prosperity. Welcome to Wowcity fellow Australians! The Australian Wowcity is a web-based platform for local business search, ideas and expression, a resource of opportunities, and a network of inspirational young people and their projects. WowCity Gladstone is your complete city guide to shopping, dining, travel, and entertainment in Gladstone. Read and write business reviews, submit articles, print coupons, and watch videos. There's always something new in Gladstone. Become a WowBuddy to share local information. Whether you have an established business in Gladstone or just starting, with or without a website, we'll be glad to be part of your business marketing solution. Our unique and proven internet marketing services can help promote your business to your local market and beyond.